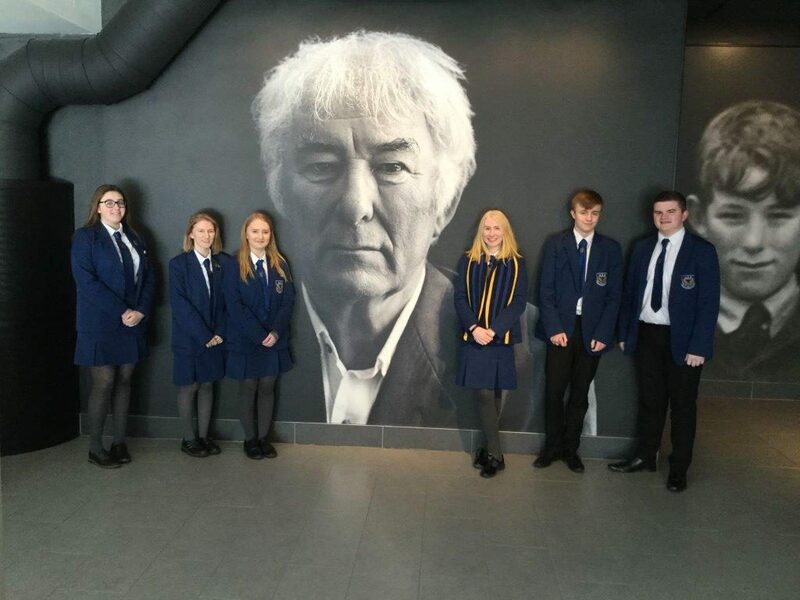 On the 12th March, the AS Level English Literature class, travelled to Bellaghy to visit the Seamus Heaney Home Place. This trip was to help expand our study of poetry and to gain better insight into the life of Seamus Heaney. The first exhibit we saw told us about Seamus Heaney’s early life and family, while doing this we were able to listen to his poems through audio wands. The poems were read by Seamus Heaney himself, which made the experience more memorable and enjoyable. Next we saw an exhibit on significant events in his life which became his inspiration. Then we saw an exhibit which was recreated to look like Heaney’s office, this was another insight as it was personal to Heaney and we got to see where all his inspirations came from. In his study there were 7 hand written drafts of his poem The Harvest Bow, this showed us the process that even a great writer like Heaney had to go through to perfect his poetry. Finally, we went to the new sensory garden which was special because we got to hear the poems as Heaney intended, outside in the nature that inspired him. After walking through the museum, we then had a lecture by Dr Frank Ferguson from University of Ulster. It was here we learned how to access the poems and to interpret them for ourselves. After lunch, we took part in a seminar with St Patricks, Dungannon. We discussed The Road Not Taken by Robert Frost and The Conway Stewart by Seamus Heaney. Alisa a student from University of Ulster led the activity and showed us how to analyse poems using the senses, finding the subjects and themes.